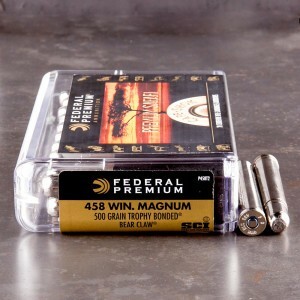 The 458 Winchester Magnum is a 11.63 by 63.5 mm round designed in 1956 as a powerful ammo for dangerous game. The initial idea was to create an American round that could compete with the powerful British rounds that had become popular Safari cartridges. The 458 Win Mag was capable of competing with the popular 375 Holland and Holland, up to the stunning 470 Nitro Express. 458 Winchester magnum offered an immediate advantage to the big bore English rounds, it could be used in a bolt action rifle. Bolt action rifles are often safer when hunting dangerous game since it is capable of firing more rounds without reloading. The rifles chambered in 458 Winchester Magnum were often cheaper than the big bore double rifles. This made the round popular very quickly with hunters and management personnel in big game hunting areas. The cartridge would become common across Africa known for it’s power and killing ability. It is capable of loading 300 grains at 2,606 feet per second, up to mighty 500-grain rounds at 2,192 feet per second. 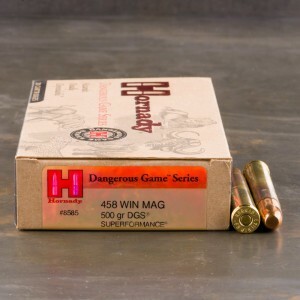 I have 9 boxes of this ammo to shoot in my Win 458 with my Lupold scope and at 200yds it is dead on. You can't buy a better or more accurate round than this Fusion Safari in 458.